Israel proved Iran is lying through its teeth on the deal, but got no reaction in European capitals. Prime Minister Benyamin Netanyahu just returned from an European tour which brought him to Germany, France and the United Kingdom. There was just one issue on Netanyahu’s agenda for the talks with the Europeans: Iran. The leaders of France, Germany and England, however, didn’t seem overly impressed by Israel’s concerns over Iran and again showed off their obsession with the Palestinian-Israeli conflict by criticizing Israel for its handling of the so-called “Great March of Return”, Hamas’ latest attempt to bring Israel to its knees via kite terror and infiltration attempts. Germany’s leader Angela Merkel, for example, told the Israeli leader that Germany didn’t annul the Joint Comprehensive Plan of Action (JCPOA), the nuclear deal between Iran and six world powers, and that Germany, France and the UK would stick to the deal. French president Emmanuel Macron concurred and even called the JCPOA “an important milestone” while England’s prime minister Theresa May also emphasized that she and Netanyahu had differences of opinion on Iran, meaning the United Kingdom had no intention to scuttle the deal with Tehran. 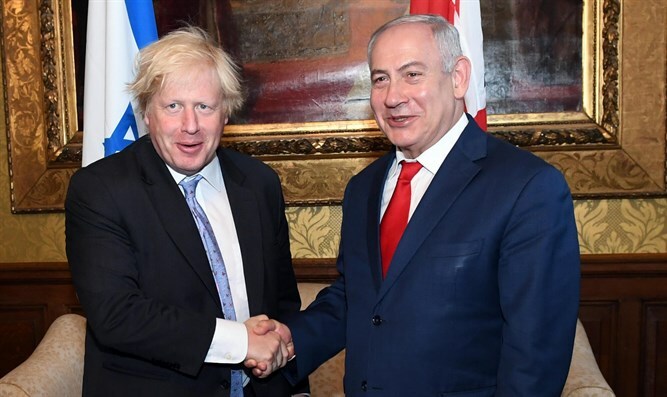 The statements of the three European leaders came shortly after the Britain's daily The Times published a memorandum the Mossad had stolen during its daring operation in Iran’s nuclear archives in Tehran earlier this year. The memorandum published by The Times dated back to 2001 and delivered the irrefutable proof Iran has been trying to produce weapons-grade uranium. “The memorandum shown to The Times authorises the military to take over the task of enriching uranium hexafluoride (UF6) by centrifuges from 3 per cent to more than 90 per cent,”according to the British paper. The memorandum - a copy of the document was published by The Times - was signed by Amir Daryaban Ali Shamkami, currently military adviser to Iran’s Supreme Leader, Ayatollah Ali Khamenei, and secretary of the national security council of the Islamic Republic. The document delivered not only proof Iran had been lying through its teeth about the nature of its nuclear program, but also showed the negotiations on the JCPOA had been based on this lie. Jerusalem Post’s German correspondent Benjamin Weinthal, meanwhile published new evidence that Iran is continuing its illicit activities in the field of developing weapons of mass destruction until this day. A significant part of the Baden –Württemberg intelligence report dealt with Iran’s role in supporting Hezbollah and Hezbollah’s activities in Germany, where the terror organization has roughly 950 operatives. Since the implementation of the JCPOA, Iran has multiplied its financial aid to Hezbollah, Arutz 7 reported earlier this week. U.S. Treasury under-secretary for terrorism and financial intelligence, Sigal Mandelker, revealed Iran’s financial support for Hezbollah now exceeds $700 million, more than three times as much as previous estimates of funding for the IRGC-founded and controlled Lebanese terror organization. “Mandelker furthermore accused the Iranian regime of using shell and front companies, and forging documents to conceal its tracks in order to fund terrorists, support weapons of mass destruction proliferation, or exploit its own people through corruption and human rights abuses,” according to the Arutz 7 report. Iran, meanwhile, inaugurated a new facility in Natanz which will produce advanced uranium enrichment centrifuges. The news about the new facility in Natanz came on the heels of a speech by Iran’s Supreme Leader Ayatollah Ali Khamenei, who ordered the AEOI to prepare for the enrichment of uranium up to a level of 190,000 SWU (separative work units). It is possible and it will happen, the Iranian dictator added. All this was known to Macron, Merkel and May and there is only one reason why they choose to ignore it: Economic interests. EU Foreign Policy Chief Frederica Mogherini was very blunt about this when she reacted to the Israeli revelations about Iran’s secret nuclear weapons program archive in Tehran and Trump’s decision to walk out of the JCPOA. Mogherini said the EU would remain united concerning its commitment to the nuclear deal with Iran. The European countries would take “the measures and mechanisms to protect the economic investments (italics mine, J.V.) of European businesses that have legitimately engaged in Iran against potential sanctions from the United States,” Mogherini said last week according to Teletrader. Trade between Iran and Europe has skyrocketed since the implementation of the JCPOA at the beginning of 2016. EU imports from Iran increased 345 percent while exports from Europe to the Islamic Republic increased 28 percent.